The T37 is an American tier 6 light tank. 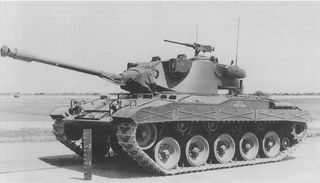 The T37 light tank was developed by Detroit Arsenal in the late 1940s to replace the M24 Chaffee. An order was placed for three prototypes. Later, some technical innovations were applied in the development of the T41 and M41 tanks. The T37 leads to the T71 CMCD. When compared to the M24 Chaffee, the T37 is significantly larger, but barely losing any mobility. However, it makes up for this for a huge boost in damage per minute, as well as increased HP pool. As the 76 mm T91 gun lost much of its trademark penetration and accuracy in Patch 9.18, this tank should not be played in the sniper way any longer. 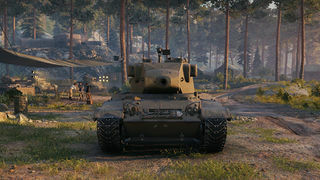 However, with a fully upgraded engine its mobility is more than capable of scouting, and be sure to use that speed to flank and destroy tanks, and chase off other lights. With its excellent view range, you can move into position and monitor vast swathes of the battlefield, spotting would-be surprise attacks. Close up, the T37 can troll big, dumb, heavy tanks by circling them, however you may not have the penetration to go through the front without mountains of silver or gold, but standard rounds are more than capable of punching holes in side and rear armor for all but the heaviest tanks. Care must be taken, for there will be many opponents more than willing to shoot at your thin, large profile. Overall this tank functions just like its predecessor. 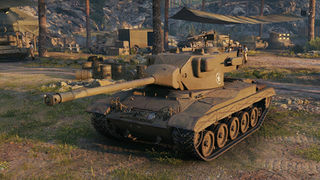 The T37's main strength seems to lie not only in its scouting abilities, but due to reduced camo, its effectiveness in a supporting role with its high damage output. Ever since 1945, the US Army started to look for its new future light tank. Sure, there was the Chaffee, but the army was looking for something that would pack a bigger punch. The production of the Chaffee ended in August 1945 with roughly 4.7k made (in the future, they would scatter all over the world, sold to US-friendly countries). Meanwhile, between January and November 1945, an army equipment committee convened twice, each time recommending a new tank development. In the eyes of the committee, this new light tank should have better firepower and mobility than the M24 and should be armed with a 76mm (3in) gun, capable of penetrating 127mm of armor (5in), sloped at 30 degrees at 914 meters (1000 yards). The vehicle was to weigh 25 tons. 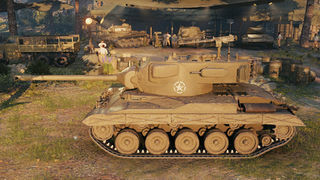 The development of this requested vehicle was started in July 1946 at the Detroit Arsenal R&D division and on 27th of September 1946, the project officially recieved a designation “T37″. It was recommended by the committee to manufacture three prototype tanks (in May 1947, it was reduced to two). The design was complete in early 1949 and a wooden mock-up was built. The vehicle had a crew of four (commander, driver, gunner, loader) and was powered by the Continental AOS-895-1 engine (air-cooled six cylinder supercharged 8,2 liter engine, providing 500 gross horsepower at 2800 RPM – note that this engine is already in the game as Chaffee’s top engine with 500hp). The vehicle weighed 21,9 tons (22,83 hp/t power-to-weight ration, ingame Chaffee has 25,74). Maximum speed was 41 miles per hour (66 km/h). Judging from the leaked pictures, the armor in the game seems historical. The vehicle was armed with the 76mm T94 gun (already in the game, Chaffee’s top gun with 137mm PEN), capable of -9/+20 elevation, historical rate of fire was 12 rounds per minute. It was not automatically loaded. Its historical muzzle velocity with AP rounds was 2600 feet per second (792 m/s). In development Phase II, the vehicle was supposed to be armed with the 76mm T91 (an identical gun to the 76mm T185 – in the game, it’s the T71′s top gun (175mm penetration), only without the automatic loading and with Vickers fire control system). Phase II vehicle was subsequently renamed to T41. Phase III (also T41) was to include an automatic loading device or a stubby case, increasing the proposed rate of fire. 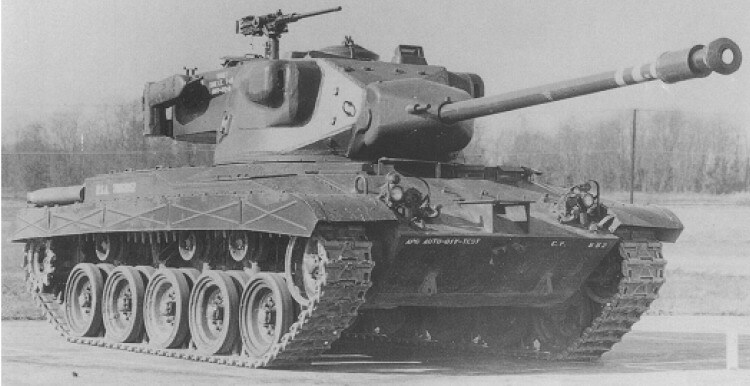 The first T37 was shipped to Aberdeen Proving Grounds in May 1949 and was tested until August 1950, when it was returned to Detroit for test results evaluation, after the outbreak of fighting in Korea. Along with the T37, the Phase II tanks (T41) were also tested in Aberdeen (three prototypes were made), armed with the aforementioned T91 76mm high-power gun in a modified turret. The original T37 project was cancelled due to the Korean war, while the T41 Stage II (Stage III with autoloader was never built, again, due to the Korean War) project was modified, specifically by changing the internal turret layout, eliminating the turret blister machineguns and increasing the turret ring size. This redesigned version by Detroit Arsenal was redesignated as T41E1 and in January 1950, Cadillac recieved a contract to build roughly 100 of those. The contract was later postponed due to Korean War (again), resulting in further modifications of the vehicle and that is how the M41 Walker Bulldog came to be, but that is a story for another time. The T41, like the T37, had a crew of four men. It had the same nominal armor, the turret just looked a bit different. Its T91 gun was capable of 12 round per minute (as mentioned, the Stage II had a loader), the elevation was -9/+20 as well. The engine and performance was the same too, but the vehicle weighed 23,4 tons, resulting in slightly worse power-to-weight ratio. This page was last modified on 23 October 2017, at 05:52. This page has been accessed 85,605 times.